Alain Vuillemet is a complete artist, who also knows how to create works of a smaller scale. In fact, the art craft boutique of Alain Vuillemet, proposes a selection of objects created by the sculptor of great talent. From the bracelet to a music stand, numerous art objects are available for sale or rental to lavishly magnify one of your special occasions. “Les sept niveaux”. 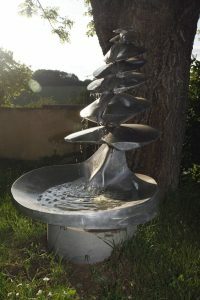 (The seven levels), Water fountain in stainless steel, a sculpture realized through boiler making process. who chose stainless steel as his favorite medium. He transforms it, bends it, hammers it, crumples it as an entity, to give to each of his creations, a sentimental and emotional quality. These objects are the best way to offer a Alain Vuillemet art piece, world-renowned artist since the mid-70’s. Passionate and well-versed in art, this craftsman puts the same passion, feelings and attention to every detail in each of his art work. It is in part, that total devotion to his art and to each of his art piece that fueled his current worldwide reputation. 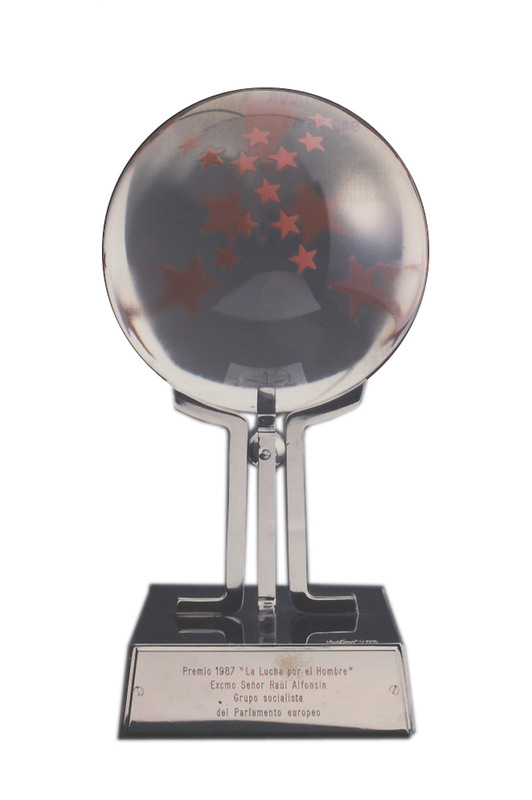 In offering yourself one of these objects, you give all of your events an extra special note. It is for example, appropriate for your business events. His universe is conducive to creativity and brainstorming. He enables businesses that wish so, presenting to employees or partners one-of-a-kind exhibits. Of excellent quality, artworks that could be purposed by Alain Vuillemet can be adapted to the space, a possible exhibit of more than 200 art pieces, spanning for the sculptor’s art production in the 70’s to today. But you could also, offer yourself an exhibit of twenty monumental pieces, which can be up to four meters tall, to give a beautiful and magnificent atmosphere to all your special occasions. You could also ask for an installation of sonorous sculptures. This unique and interactive exhibit can allow you to mark attendees’ spirit in a magnificent manner. Le prix pour l’homme the work was realized from a proposal of the Quadrillage Agency for the socialist group of the European Parliament. But Alain Vuillemet can also create one-of-a-kind objects at the image of your business, like he did for many past occasions, for example trophies and furnishings. But there’s nothing that this virtuoso can’t do with stainless steel or other metals, you can discover other works in his boutique of sculpted objects. He will be able to find a solution to each of your needs. Professionals are not the only ones who can enjoy Alain Vuillemet’s artwork. In fact, art lovers can acquire for themselves, a vast choice of sumptuous art furnishings. These artworks bring class, beauty and sensibility to spaces they grace. Whether it is a dining table, coffee table, jewelry, music stands, numerous artworks are possible to bring splendor to your home. Each of the art furnishings that this virtuoso makes, are custom-made, so that they can be completely adapted to the room or space that will receive them. You then can rest assured of a unique artwork specially thought for you and your space. It is the guarantee of a work and magnificent art piece, of a quality and sensibility unique and especially created for you. Don’t hesitate to ask for a free estimate. For this estimate, you can immediately go to the artist’s online boutique. This virtuoso will personally think each of your requests, to offer you works of art perfectly adapted for you.